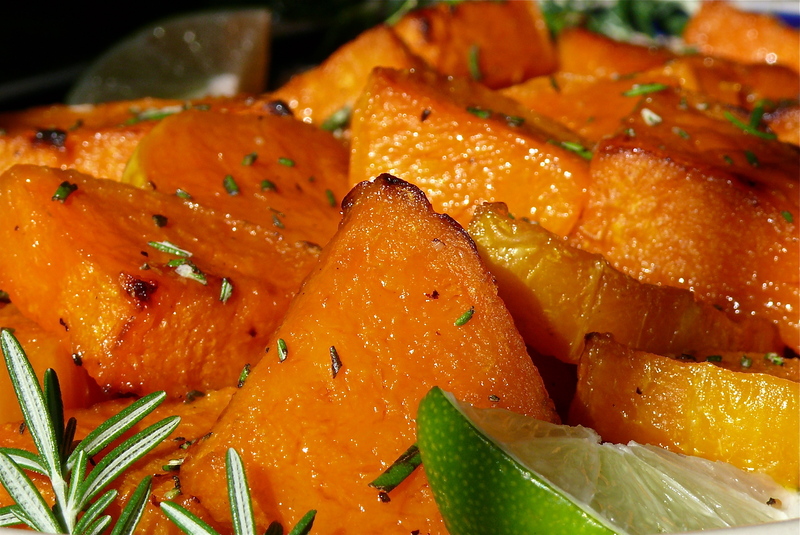 Roasted Butternut Squash with Lime Juice | What about this? Fists would bang on the table! Endless whining would begin! And a cacophony of complaints would strike my ears! All those reactions would occur, well maybe not the fist banging, if I deviated too much from my family’s traditional Thanksgiving menu. Whining would definitely begin if I were to roast a turkey any way other than my dad’s way and complaints would be nonstop if I did not make my family’s ultimate favorite side dish – a Chinese form of “stuffing” made with rice, Chinese sausage, mushrooms and dried shrimp. I am granted a little bit more leeway, though, with the rest of the Thanksgiving menu. Because I like to try out new recipes, our Turkey Day menu varies a little bit from year to year. Being more health conscious now, I have replaced recipes that are loaded with fat and sugar and opted to prepare more healthy ones. Gone is the sweet potato casserole with its butter, eggs and brown sugar. This year’s replacement for that is Roasted Butternut Squash With Lime Juice and I think my family will enjoy this dish with its combination of sweet, savory and tangy flavors. No additional sugar is necessary in this recipe, because the natural sugar in the squash is brought out when it is roasted. Fresh chopped rosemary lends the dish a certain earthiness and the little bit of lime juice adds an interesting layer of depth. Top all of that with the fact that this dish can be made ahead earlier in the day and reheated just before serving! 2. Cover two rimmed baking sheets with foil. 3. Peel butternut squash and cut crosswise into 1/2-inch-thick slices and then cut the large rounds into quarters. Set aside. 4. Mix together in a large bowl the olive oil, butter, and the lime juice. Place squash into this mixture and toss thoroughly to coat all sides. Sprinkle with salt and pepper. Toss again. 5. Divide squash evenly between the baking sheets, arranging them in a single layer. 6. Roast for 20 minutes. Turn squash pieces over and roast until soft and golden brown, about 20 minutes longer. 7. Season with additional salt and pepper to taste. Sprinkle with chopped fresh rosemary. Serve warm with lime wedges. 8. Do Ahead: Can be made 4 hours ahead. Let it stand at room temperature. Rewarm in 400 degree oven until hot, about 10 minutes. 1. For easier peeling, stick the whole butternut squash in the microwave oven on high for about two minutes, then proceed with peeling. 2. When cutting the squash try to cut the pieces the same width and approximate size. This will promote even baking and enhance overall appearance. 3. I like to chop the rosemary just before serving, so that it keeps its fresh color. YUM! Sounds good, but I want to come to your house to try everything out!!! Especially that “stuffing”!!!! I bet it was scrumptious!! Made this for Thanksgiving. It was delicious!!!! !